I have been making my homemade Halloween costumes since 2004. It is always a secret until I reveal on Halloween or at a party right before Halloween. Friends are always looking for hints and trying to guess what I will be. The best part is always the reaction when I reveal that year’s costume. I love the excitement and amazement that my friends and family share with me once they see my costume. 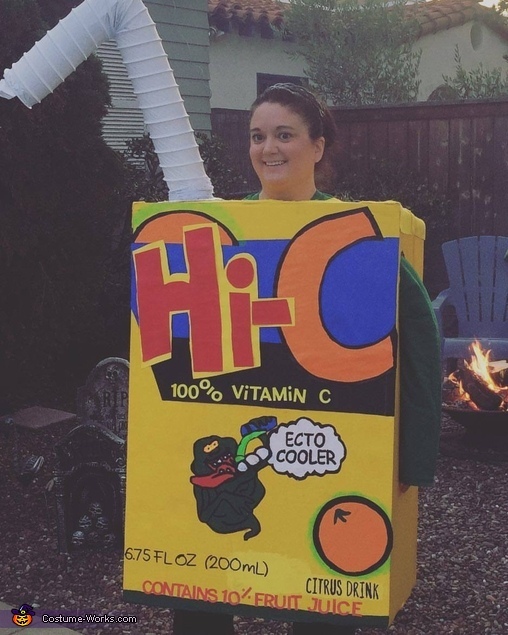 This year I chose to throw it back to an old school Hi-C Ecto Cooler Juice Box. The level of difficulty to make this costume is EASY. You need a few simple materials. I try to keep my costumes supplies very cheap and to reuse items I already have around the house or recycled materials. Step 1: Take two Tri-Fold Presentation Boards and invert them so the color is on the outside. I found yellow ones so it made it easier since I didn’t have to paint them but you can get white and just paint them yellow. Once the boards are inverted with the color on the outside, form them into a rectangular box that will fit your body. Mark the inside of the box with a line to where the edges of the two boards meet. This will very with each person depending on their size. Use your glue gun to glue the rectangular box together. Step 2: Use construction paper to make the design of the Hi-C, oranges, Slimmer, and Ecto Cooler sign. Once I drew all these out on construction paper I then cut them out and painted them with craft paint to make them bolder and stand out better on the board. Then glue to the board. Step 3: Take your various size & font design Alphabet Stickers and spell out all the words & descriptions. Then apply them to the board. I add a little glue to them just to make sure they stick throughout the night. Step 5: Glue spare cardboard to the top and cut a hole for your head. Then glue felt on top to cover cardboard and to make it more comfortable around your neck. PS: I didn’t have time but to make the costume with more details you can add the same design to the back and also add on one of each side the nutrition facts and the ingredients.